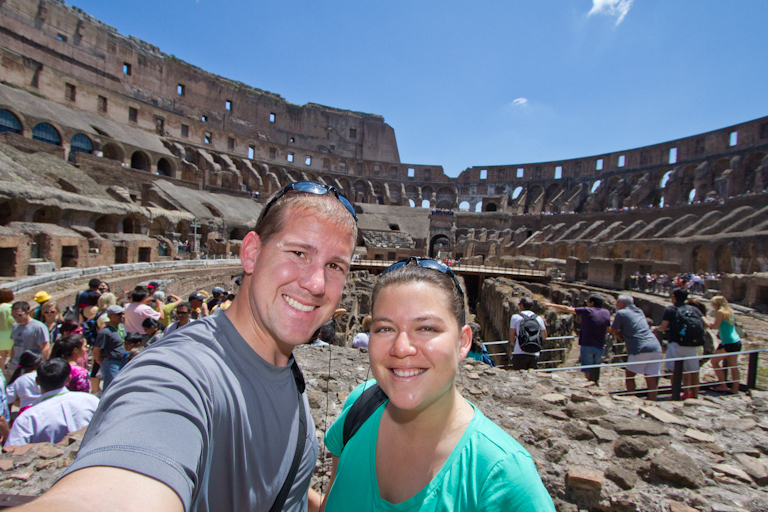 Today we're going to the Colosseum and anything else we happen to squeeze in. Here's a look at the places we'll be visiting. Surprise! We woke up at a decent time today! Well, decent meaning we set the alarm for 10am, then rolled out of bed at 10:45am. Not a bad start to the morning. A quick banana for me and nectarine for T and we’re out the door. 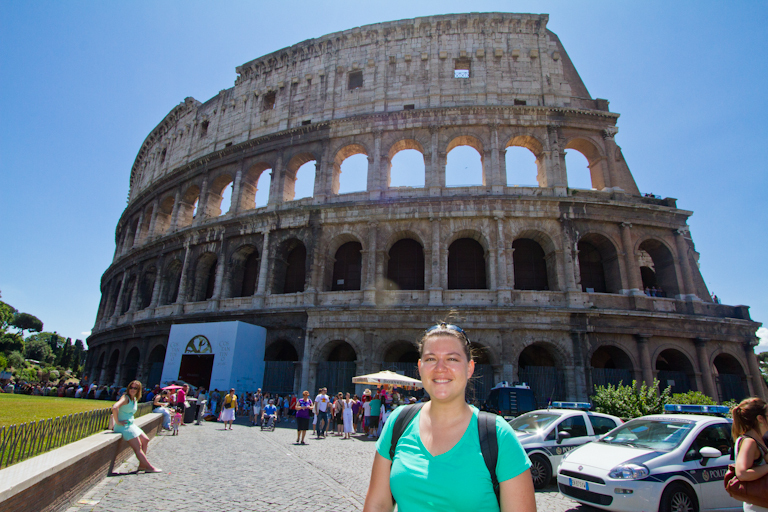 Today we’re going to the Colosseum plus whatever else we might be able to squeeze in. We’ve had these Roma passes for the past two days and only used them for one 1 mile bus ride. 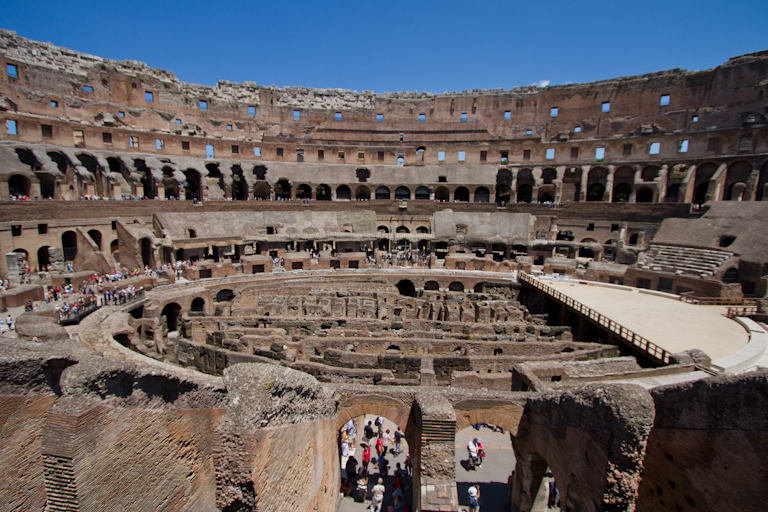 We could take a bus down to the Colosseum, but given how they’ve made Theresa feel so far, we’re going to walk it. I looked it up later and it turns out it was a 1.1 mile walk. It was fun seeing the interesting sites along the way. We did try to keep to the shade and took a few stops for water breaks, but eventually we made it. 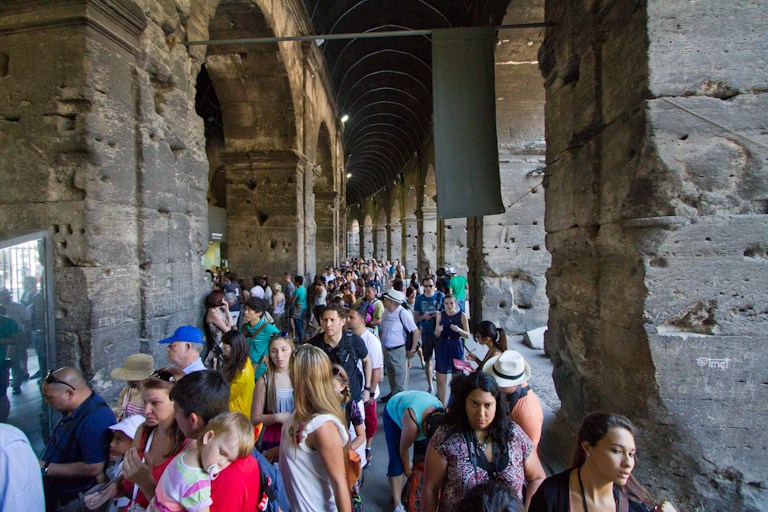 The line at the Colosseum was ridiculous. 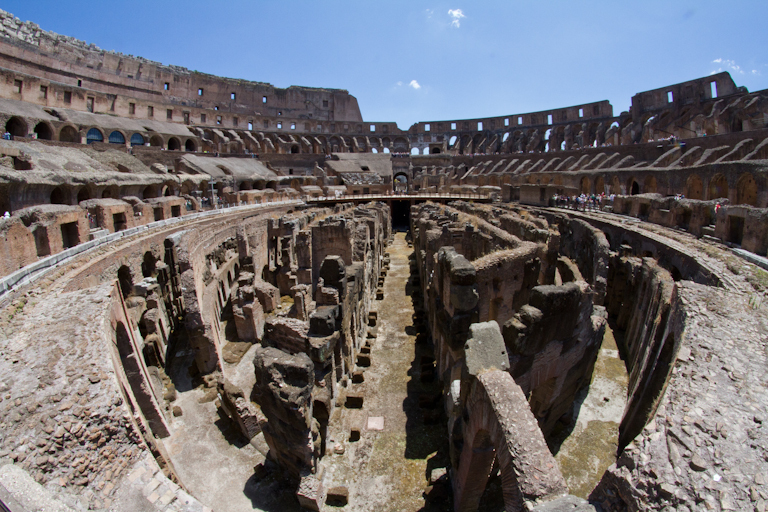 Imagine the line stretching ¼ of the way around the Colosseum, and snaking on itself in a few more places. It was at least 6 people wide, so I won’t even guess how long of a wait it was. 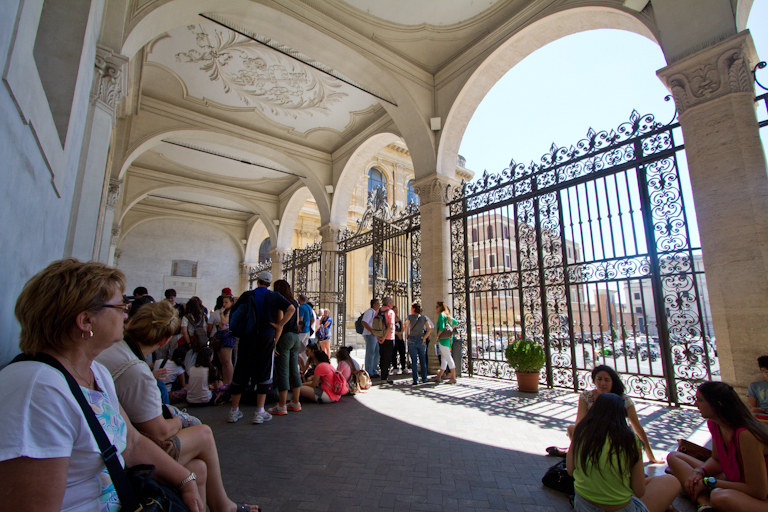 Luckily because of the Roma pass, we get to bypass that line and go in a special entrance! It’s totally worth it to us just for that! In less than 5 minutes we were inside and starting up the Rick Steves’ audio guide. The view from the Emperor's Box inside the Colosseum. 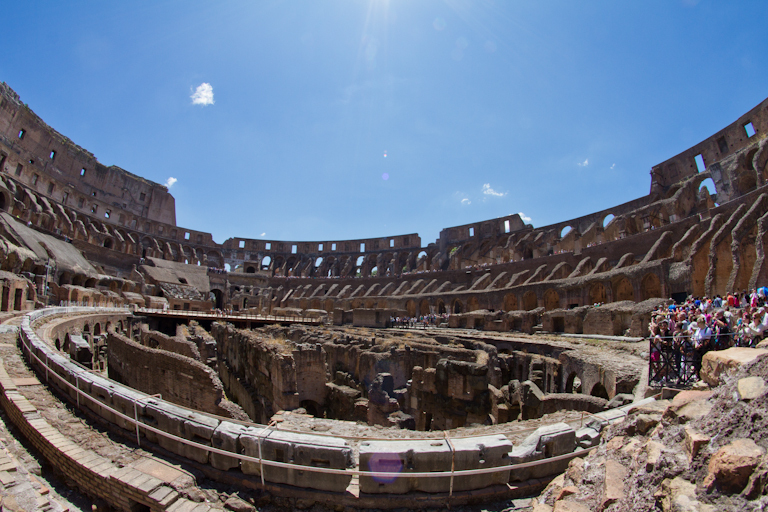 It was hard to believe that this whole place was built in only 8 years back in 72 A.D.
Can you imagine 50,000 screaming fans here and all the battles they witnessed? It was written that 9000 wild animals were killed during the inaugural games. Circling the lowest level, we arrived in the center at the Vestal Virgin's box, looking back towards the Emperor's box. We climbed some very steep steps on the west side up to the 2nd level and the cheap seats. Again we paused in the shade to listen to the audio guide, then continued out to see the center. 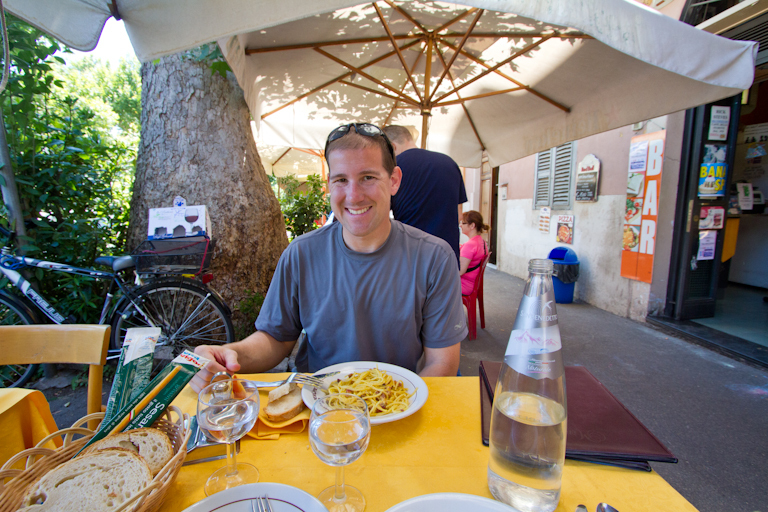 T isn’t enjoying this Italian sunshine, so we stayed in the shade as much as possible. 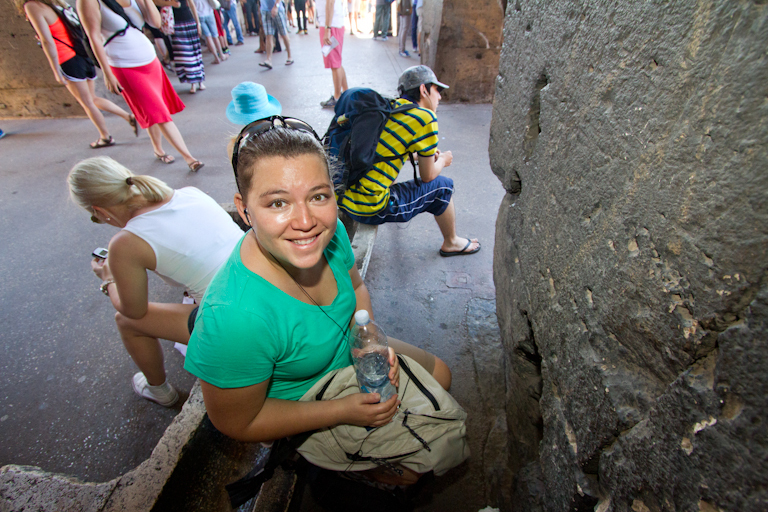 When the guide suggested we walk around the 2nd level, T found a place to sit, while I walked it and took a few photos. 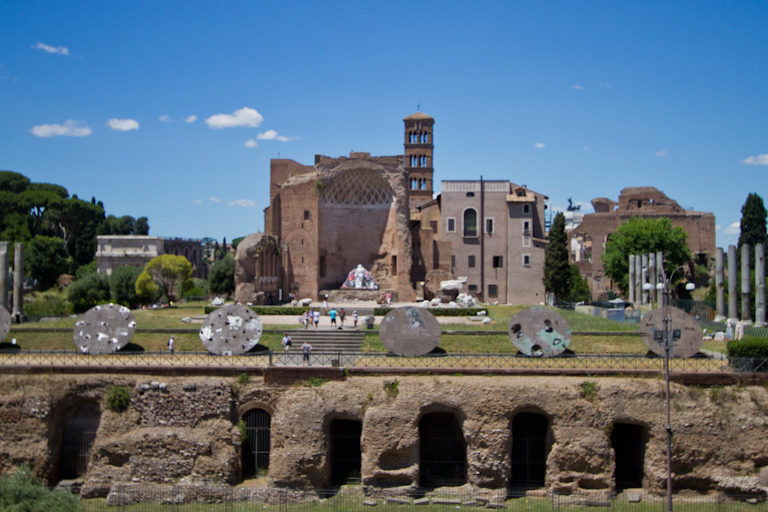 Originally called the Amphitheatrum Flavium, because it was built by the emperors from the Flavian dynasty. 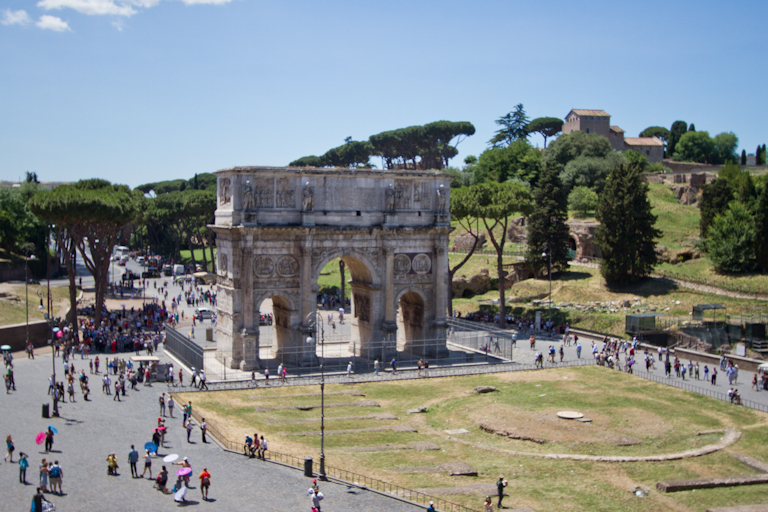 Looking over to the Arch of Constantine, erected to celebrate a battle won in 312 A.D.
And looking towards the Temple of Venus and Roma. 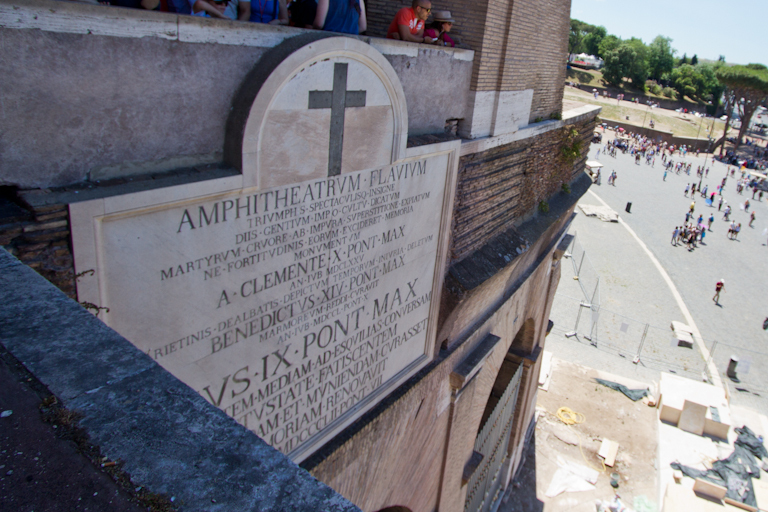 Looking over the Colosseum from the highest point you can climb. I joined back up with Theresa a short time later. 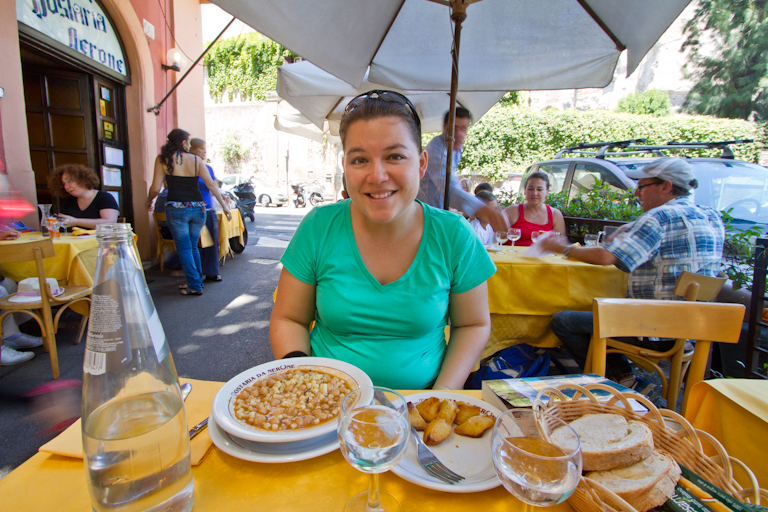 Our entrance ticket gets us into the Colosseum, Roman Forum and Palantine Hill, but since we only had a light breakfast, T needed to eat something. 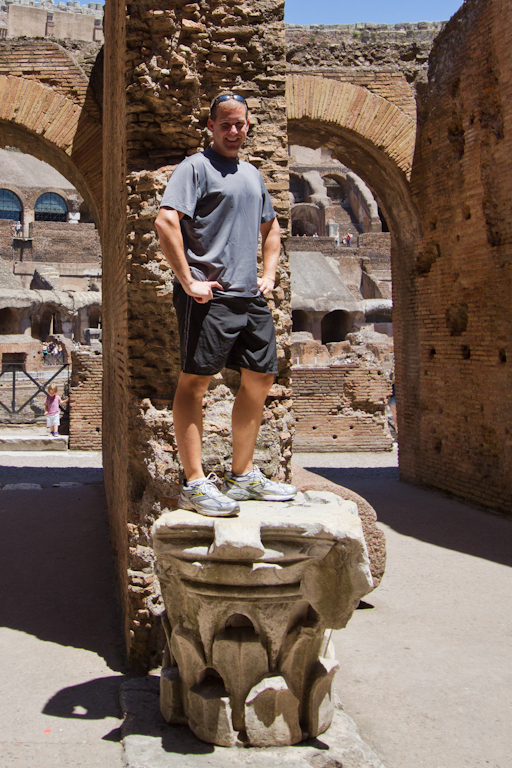 On the way down, I saw this pedestal and had to get a classic photo on top of it. 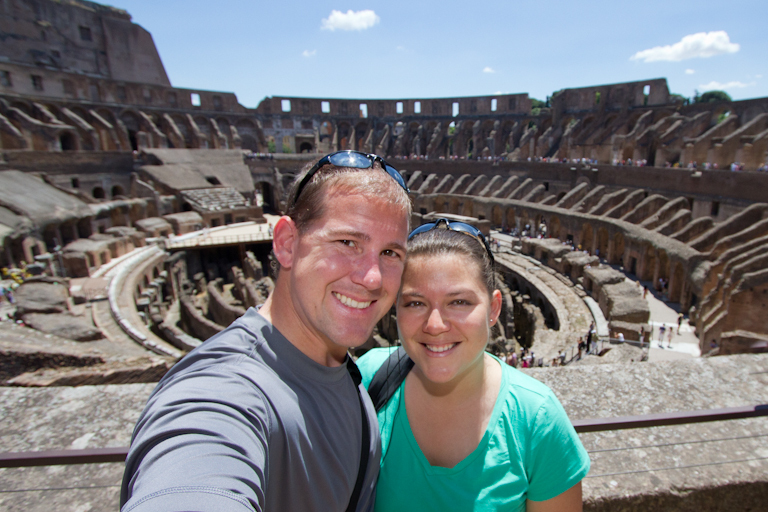 We had a fun time at the Colosseum this time. It was great to explore at our own pace. 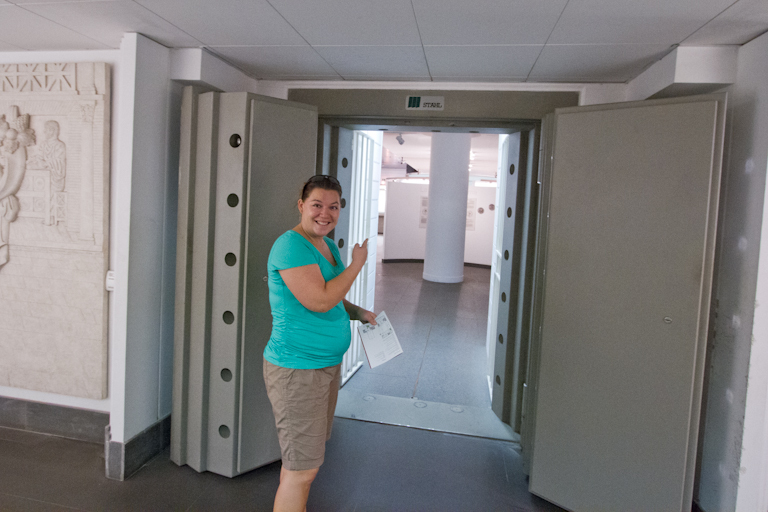 Maybe next time we'll upgrade and get the tour that takes you to the floor level. 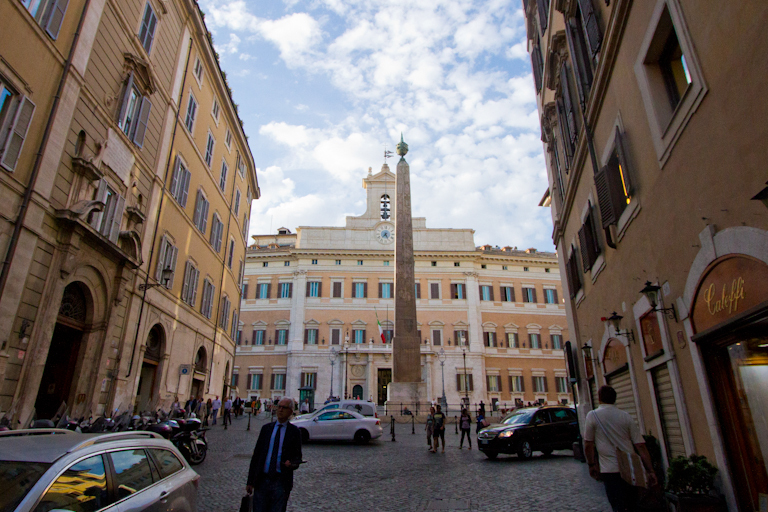 The Rick Steves’ guidebook suggests two different places for dining near the Colosseum, both near our next stop, the St. Peter in Chains church. We selected the sit down place for lunch. Theresa was really feeling like vegetables (why I don’t know, they’re yucky), so she asked for minestrone soup. Unfortunately, it wasn’t available today, but our waiter suggested the other soup and Theresa agreed to that plus a side of potatoes. T didn’t like her soup. It was a chick-pea soup with tons of chick-peas, some noodles, and no vegetables at all. She started picking the chick-peas out and eating just the noodles, but gave up after a while. I ordered the spaghetti carbanara, which is pig cheek, eggs, and cheese. I have to say it was probably tastier than the carbanara I had a couple nights ago for dinner. 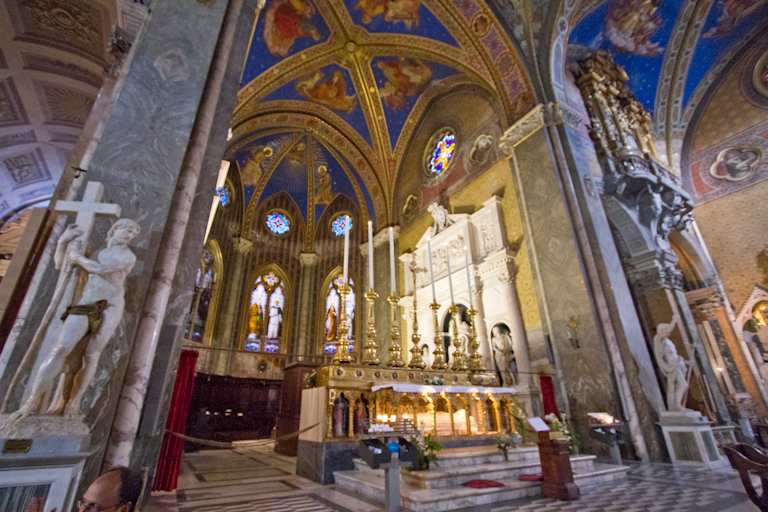 Our next stop is the St Peter in Chains church. 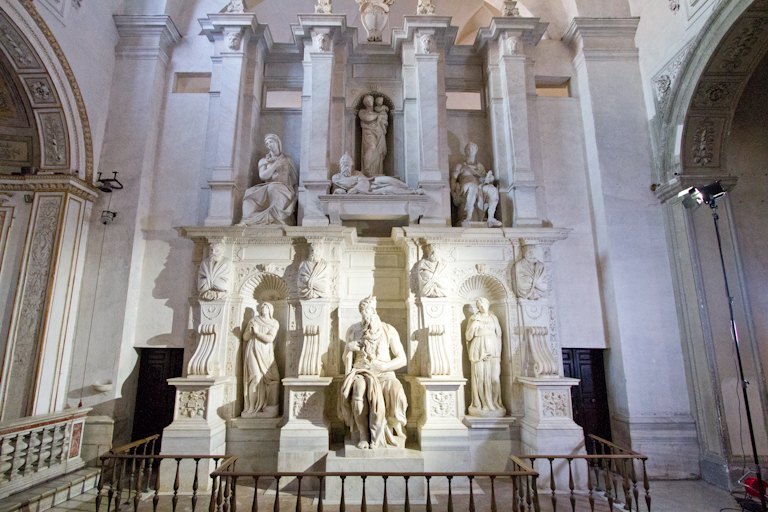 I’d wanted to go here after learning that it housed Michelangelo’s statue of Moses. We just saw a copy at Forest Lawn a little over a week before, but why see a copy when you can see the original! The map we have from the hotel isn’t that detailed and we actually walked past it a block or so before realizing it then turning around. No wonder either. Look at the front of this place. It doesn’t look much like a church to me..
We walked up to the doors and saw they weren’t going to open until 3pm today. It’s 2:30 now, but there’s benches and shade, so we decided to wait it out. 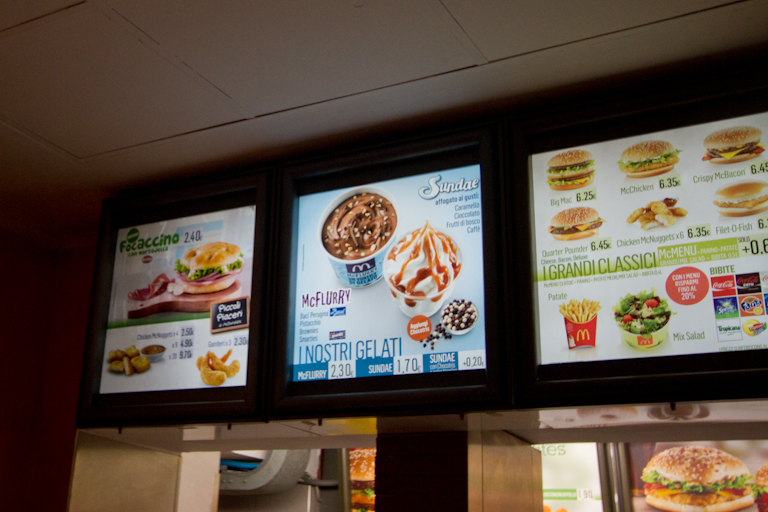 While waiting, we looked over our all the places we can go at our next stop in Florence and looked at ideas for dinner tonight. 2:55 rolls around and there’s starting to be a bit of a line in front of the doors. People start leaving the benches to stand in the line, but we’re in no rush. As it turns out, that 3pm was not quite correct. It came and went and people started getting more ansy. Finally at 3:15pm the doors open and the masses enter. We wait a couple more minutes to avoid the rush then head inside. The inside looks quite a bit different from the outside. This church has some darker themes. A grim reaper. 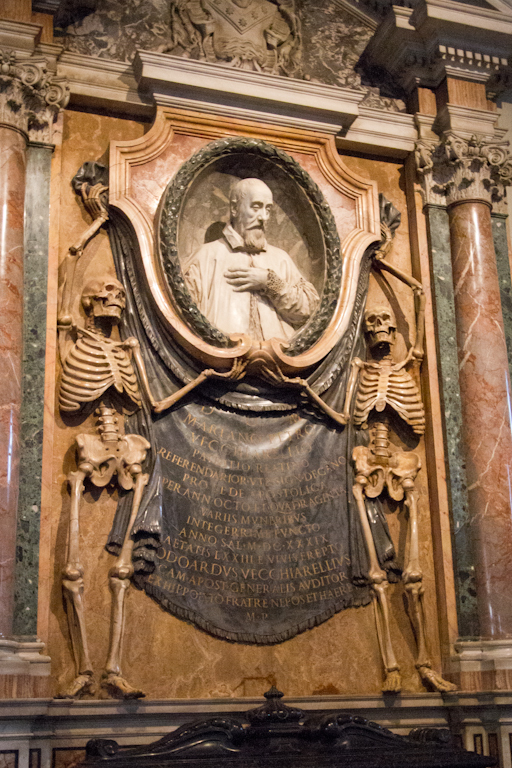 And skeletons supporting a bust. 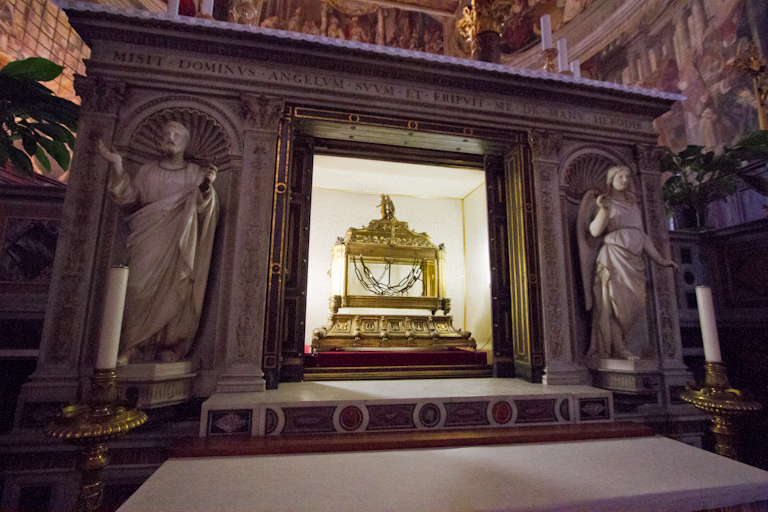 Inside the reliquary are what the church is named after, the chains of St. Peter. 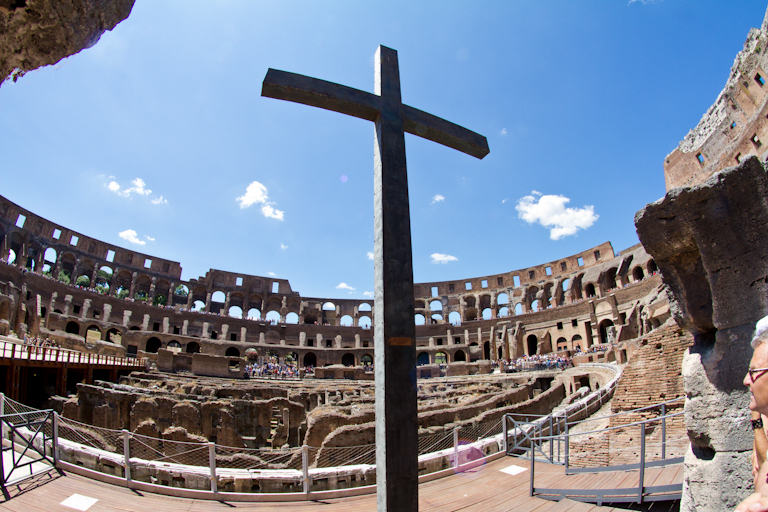 Supposedly, these were the chains that bound Peter when he was imprisoned in Rome. Hard to believe, but maybe it’s one of those things you have to take on faith. Exploring further, we figured out why they were 15 minutes late opening. 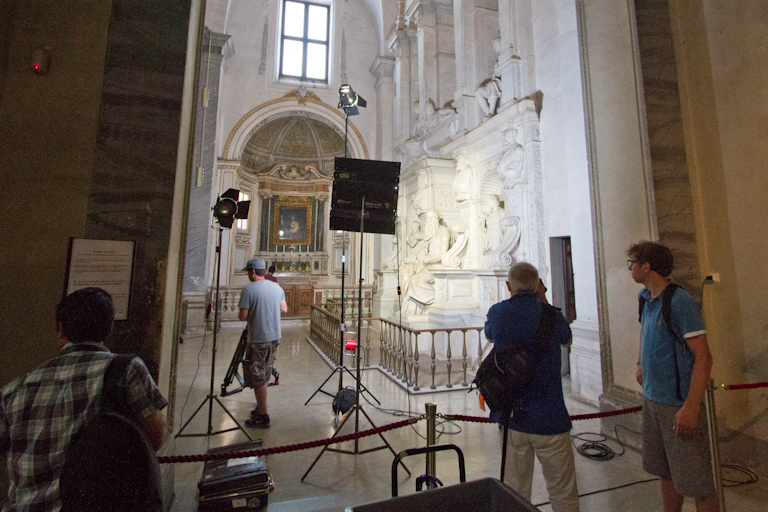 Turns out, there is a film crew from the Discovery Channel shooting a show about Michelangelo. 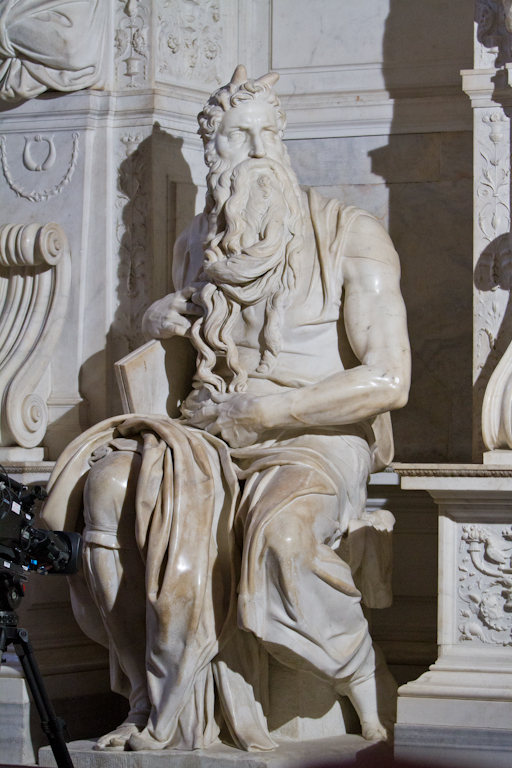 They’ve got their lights and cameras all over the place surrounding Moses. They’re trying to film sweeping shots, but now that they’ve let the tourists in, people keep taking pictures and using flash, which messes up their video shots of it. They keep repeating No Flash, Please No Flash, but people either don’t know how to use their cameras or don’t care. They’re also in the way of everyone’s shot with their equipment, so I don’t think they were getting much sympathy. I was able to shoot around them by having a little patience, and got some decent shots with no one in them. 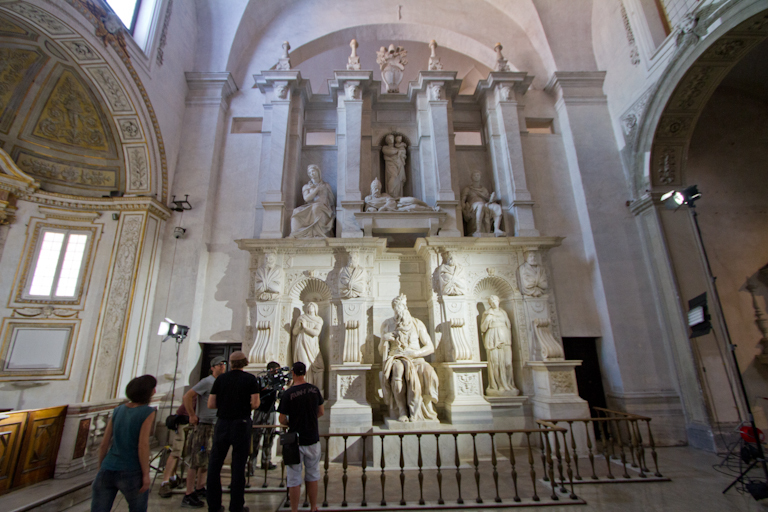 Now I’ll have to look out for the Discovery Channel Michelangelo special to see what they have to say about him. 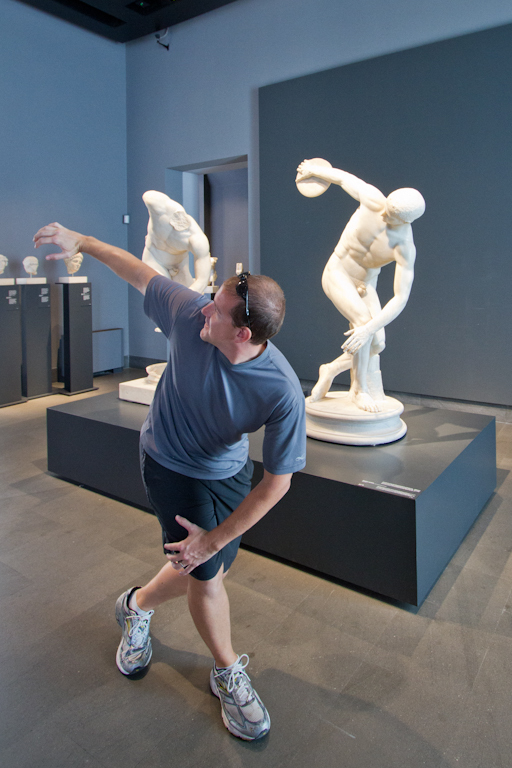 Not as impressive as Michelangelo's David, but still interesting. 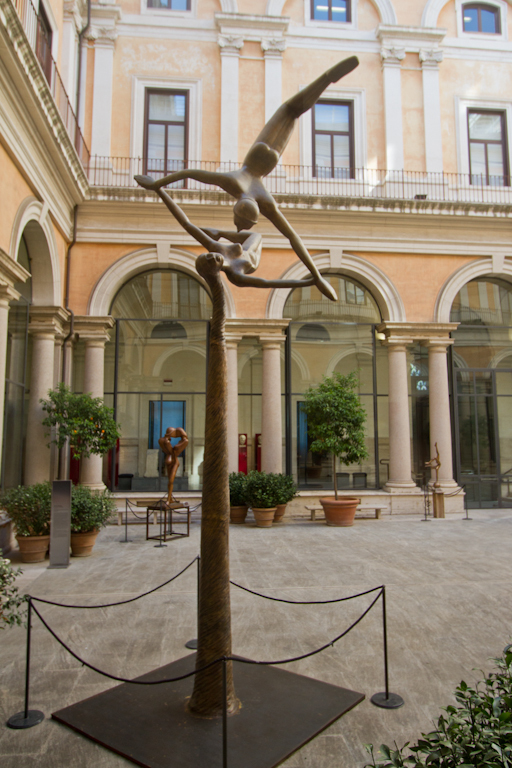 After the church, we walked north to the National Museum of Rome. This was a stop Theresa picked out because of what they have in their basement. 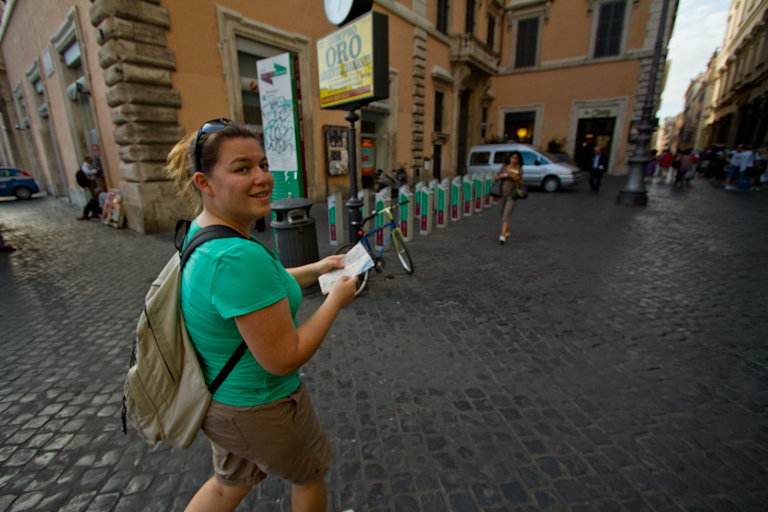 Here we used the second “free” entry of our Roma Pass. 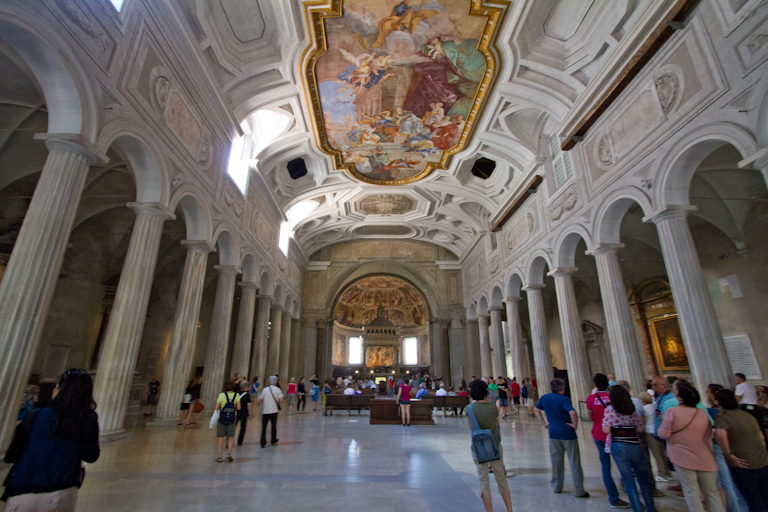 Compared to the Vatican yesterday, this place is dead. It’s awesome! 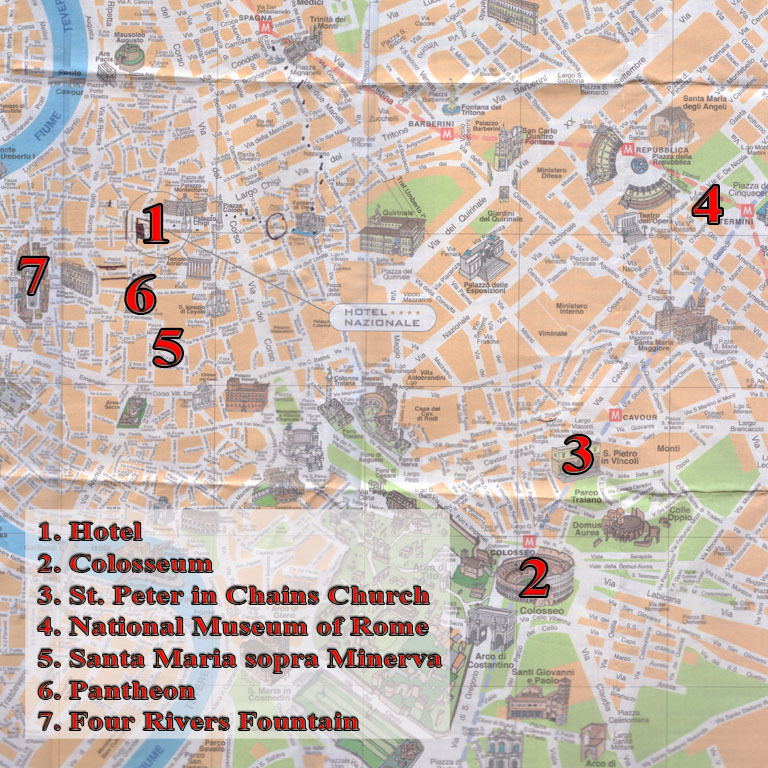 We grabbed a museum map and headed downstairs to one of the finest Roman coin collections around. 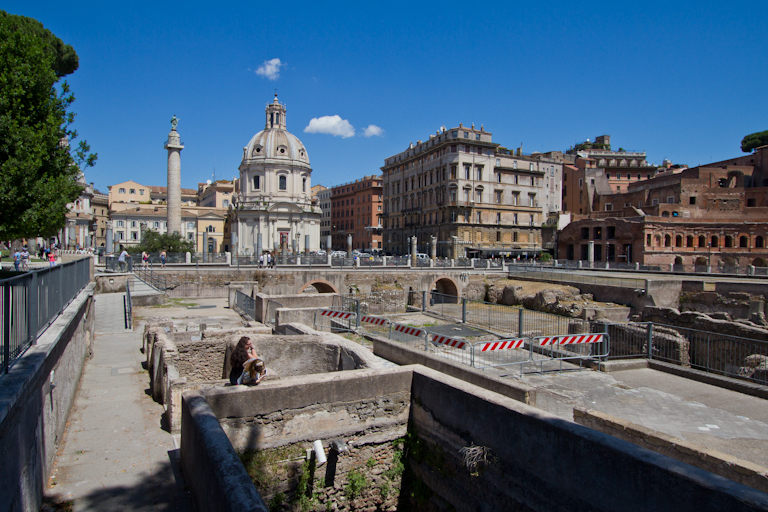 Seriously, they have coins all the way back to the beginning of Rome and almost every year up to the present. 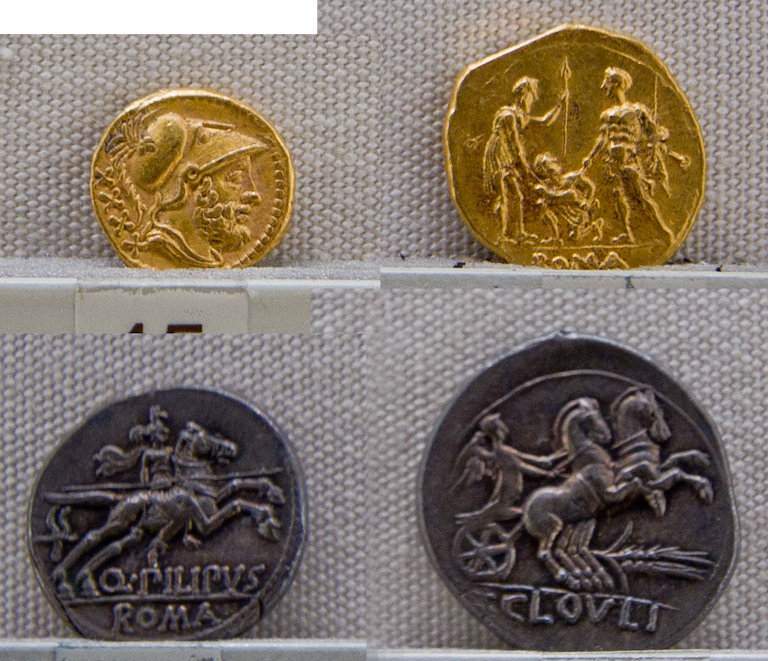 We start in early Rome with a non standard coin of bronze that was only valued on the weight. Everyone had scales to see how much it was worth. Also these things were pretty large, so just a few would fill your pockets. 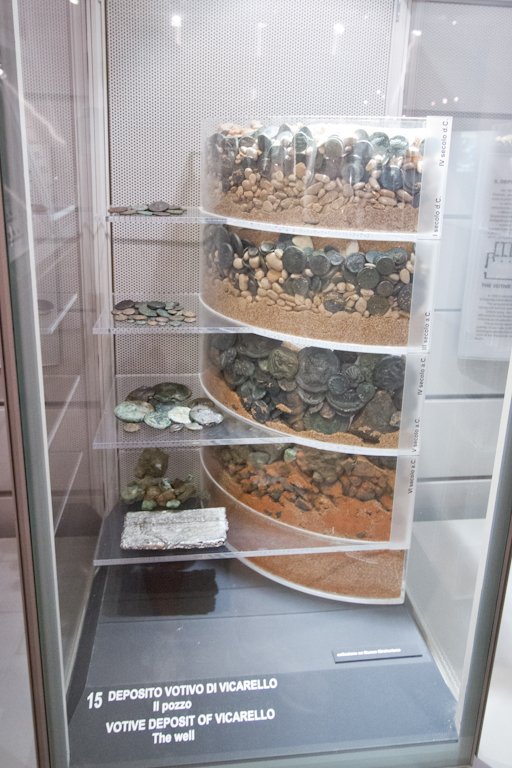 There were at least 60 such display cases containing coins like this. 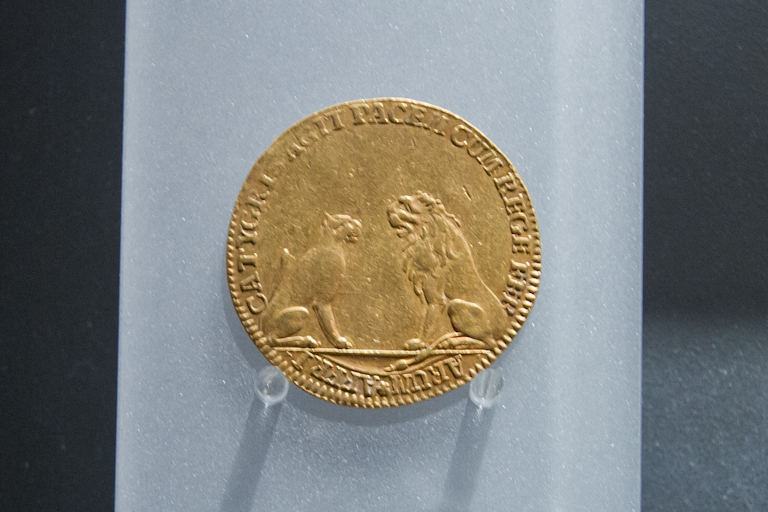 Each had a write-up about the coins from that period. 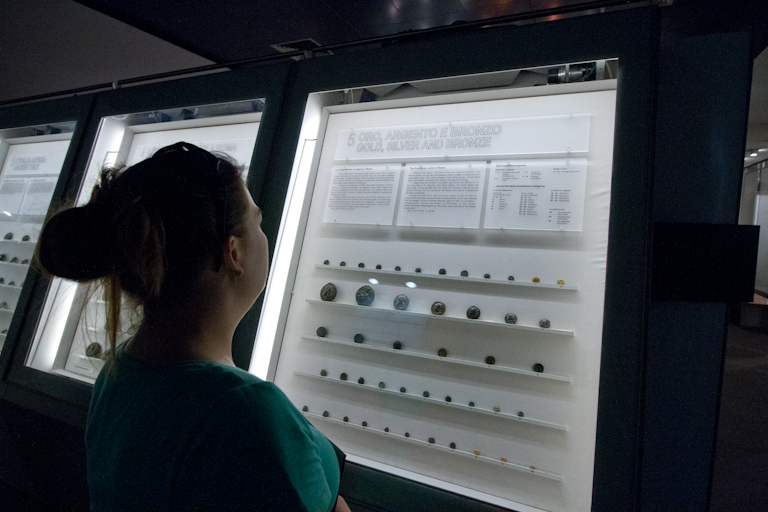 We learned how the various emperors introduced silver then gold, then different denominations, purities, etc to control the market of coins. It was quite an in depth guide speaking about each of the coins from the times. The stamps on the coins were interesting too. T liked the horses and chariots. 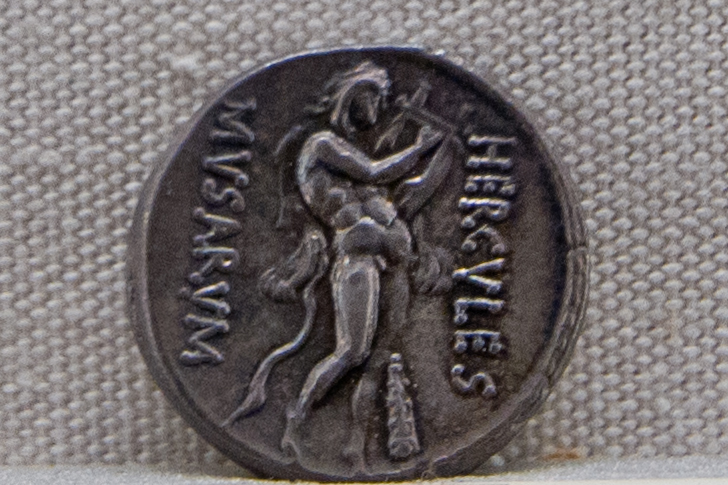 She found one of Hercules for me from 80 A.D. 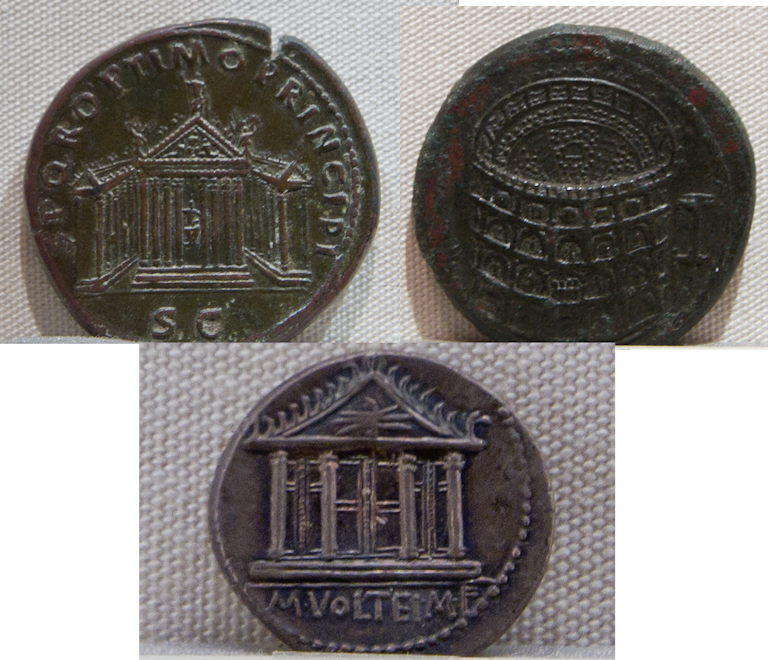 I really enjoyed seeing these coins showing old buildings. 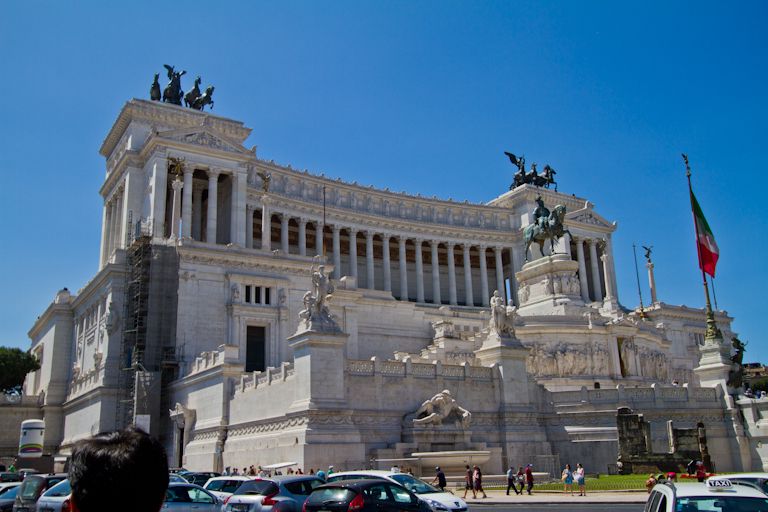 I recognize the Colosseum in there. So where did this huge collection of coins come from? Quite a few came from Castle Vicarello 23 miles north. 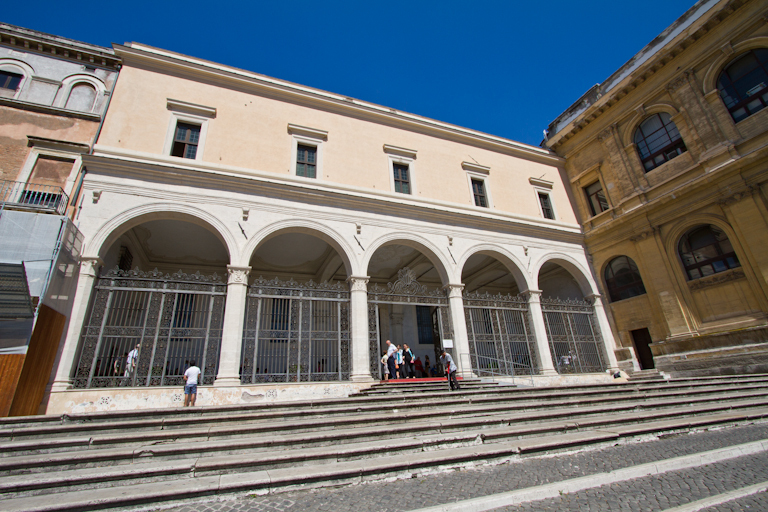 While renovating the bath complex there in 1852, the well leading to the hot springs was discovered to be filled with metal coins. 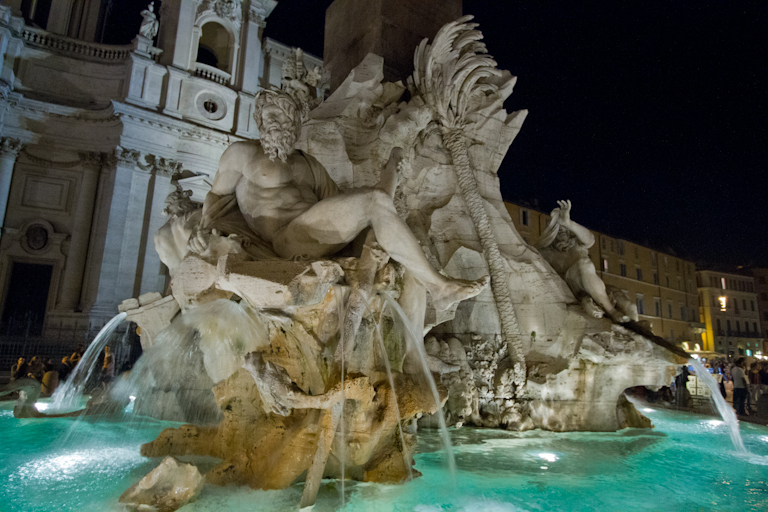 The deepest layers contained bronze coins dating back to 800 B.C. Progressing upward, newer coins were found. 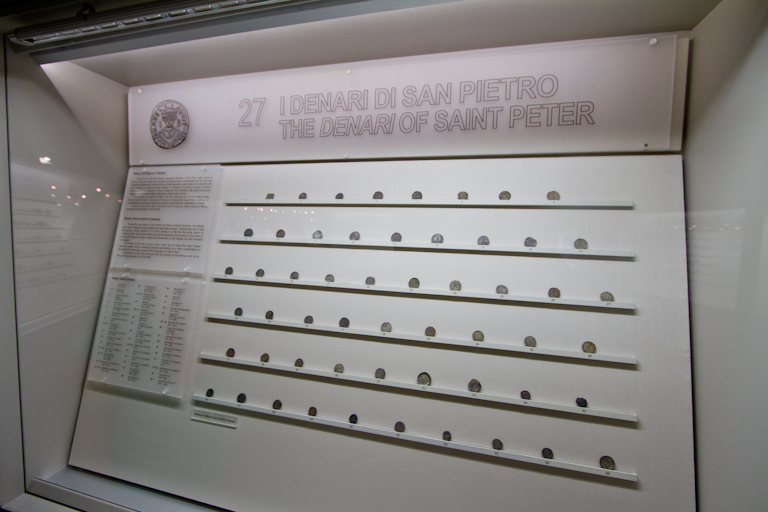 The Vatican also had it's own minted coins. 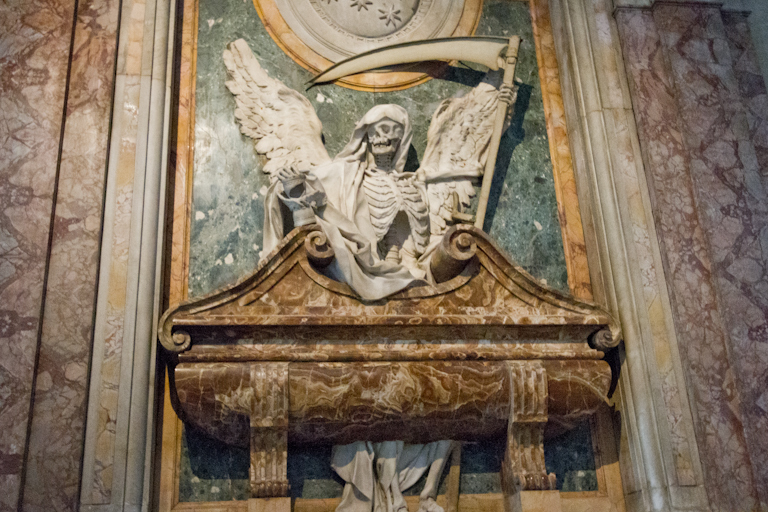 Finding a little bit of Disney in everything, Theresa suggested this pope looked a bit like Buzz Lightyear. We kept seeing a progression in the design and symmetry of the coin. 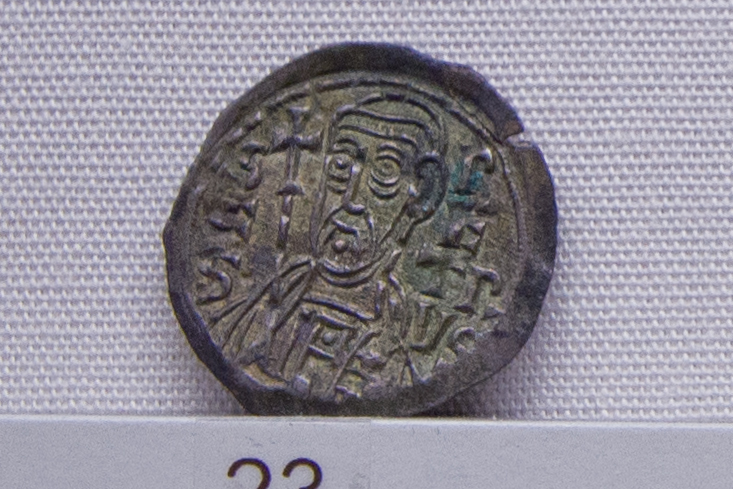 The first coins were bits of metal with a stamp somewhere on the face, usually off center. These later ones were more detailed images and better symmetry. 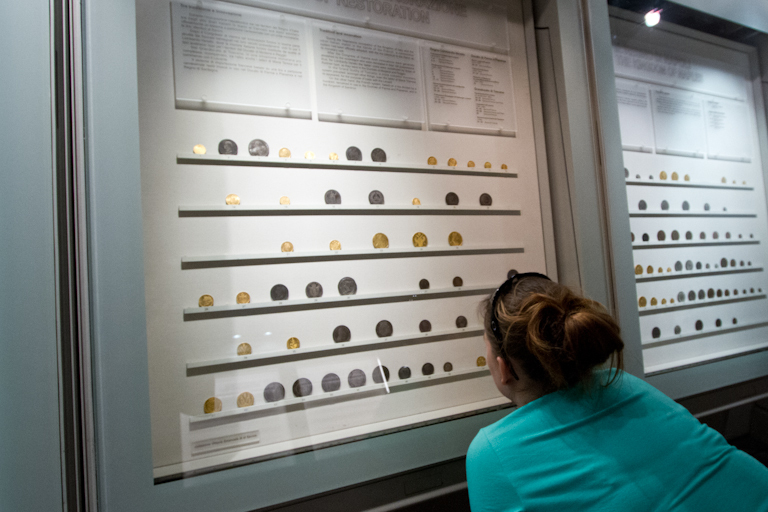 I joked with Theresa that the final panel would say something like “These reproductions give you an idea of the coins used…..” We had that trick played on us in a castle in Germany on a previous trip. We walked around a whole castle, amazed at the beauty and opulence, and then in the final room it showed pictures of the castle after it had been bombed to pieces in the war and then restored in the 60s to what you see today. 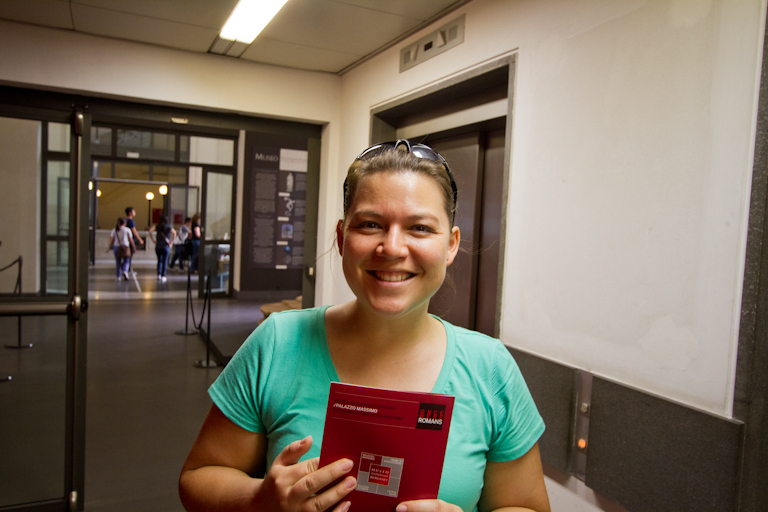 We walked quickly through the rest of the levels of the museum. 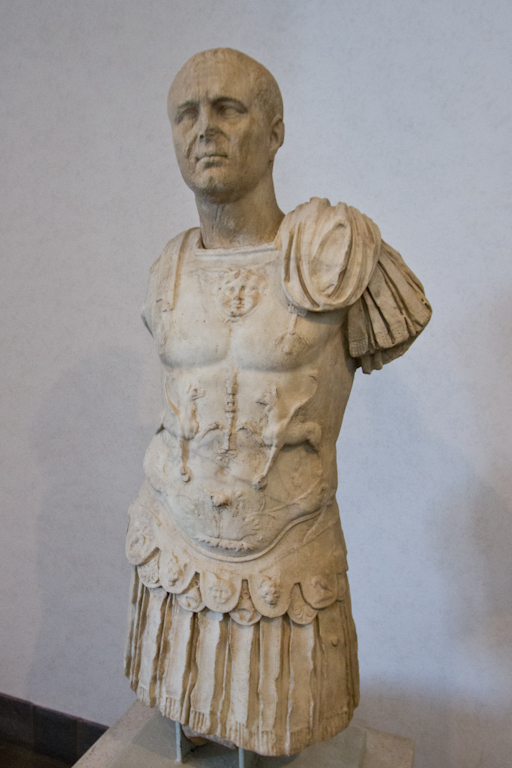 There were lots of statues here of various gods, heroes, and nobles. 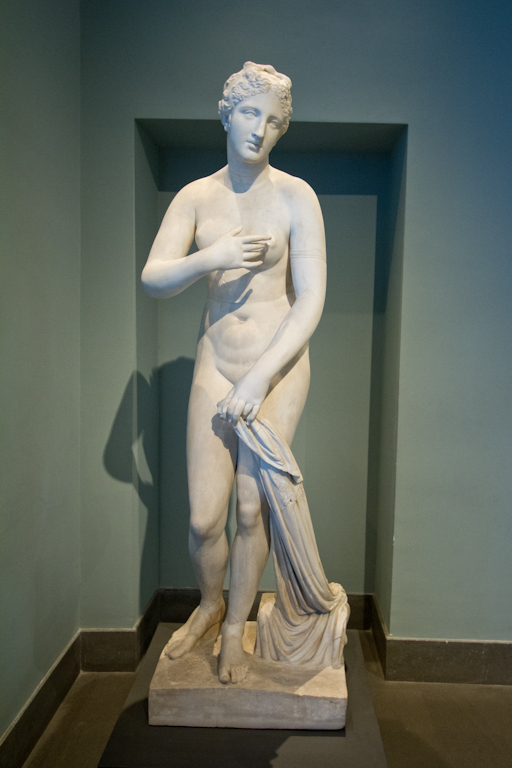 A statue of a modest Aphrodite. 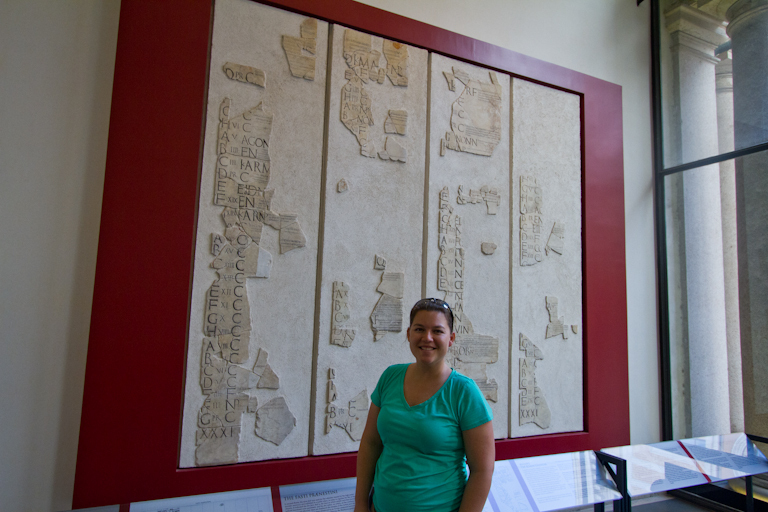 Theresa in front of a very old calendar and rules of what you were allowed to do on each day. Again finding Disney everywhere, The Lion King. And this girl with the long hair must be Rapunzel. I liked this guy's armor. 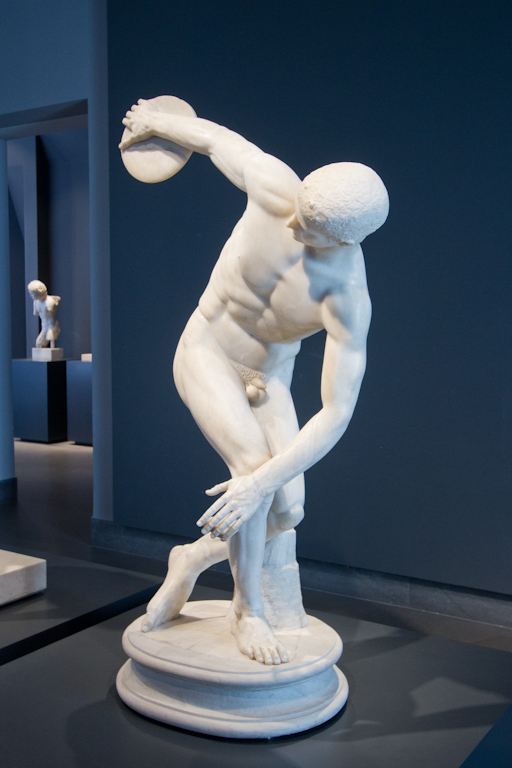 One of the best early Roman copies of the Greek Discuss thrower. 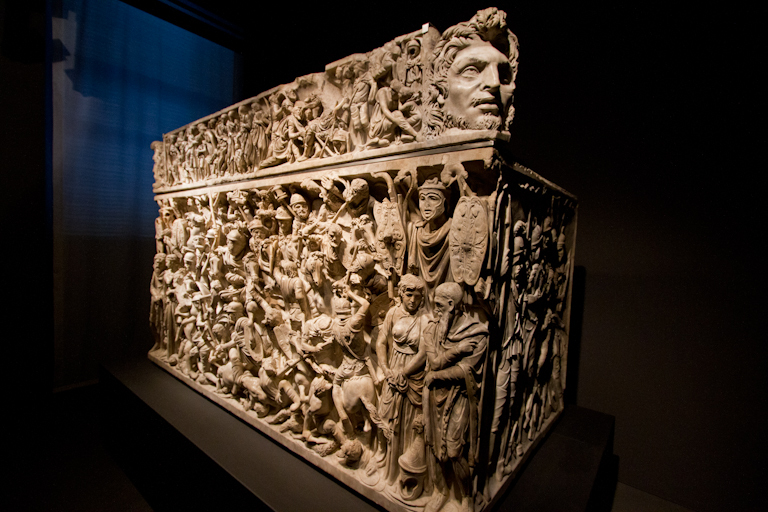 One of the most detailed sarcophagus I've seen. There were two other things I was hoping to see, but I knew I’d probably only get a chance to see one. 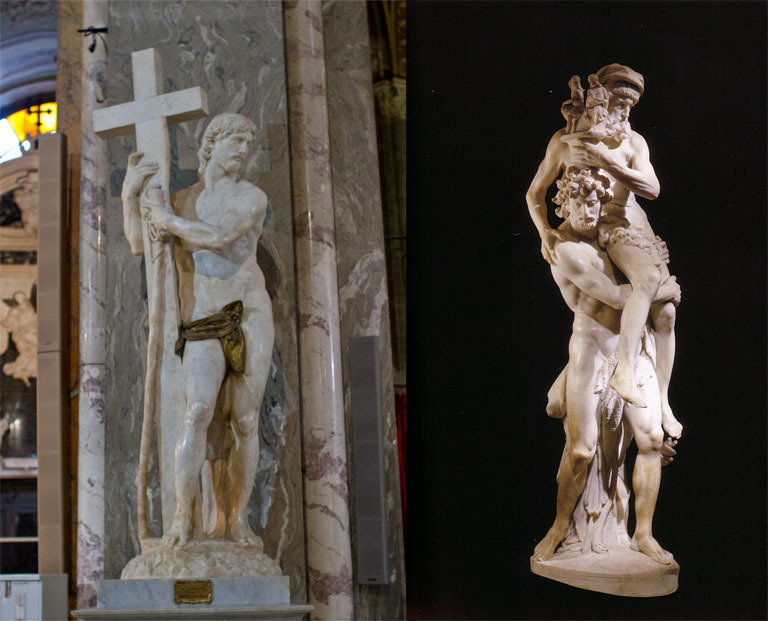 Either the Ecstasy of St Teresa by Bernini or Christ Bearing the Cross by Michelangelo. Checking the guide book, the St Teresa church closes at 6pm and it’s 5:55pm now. 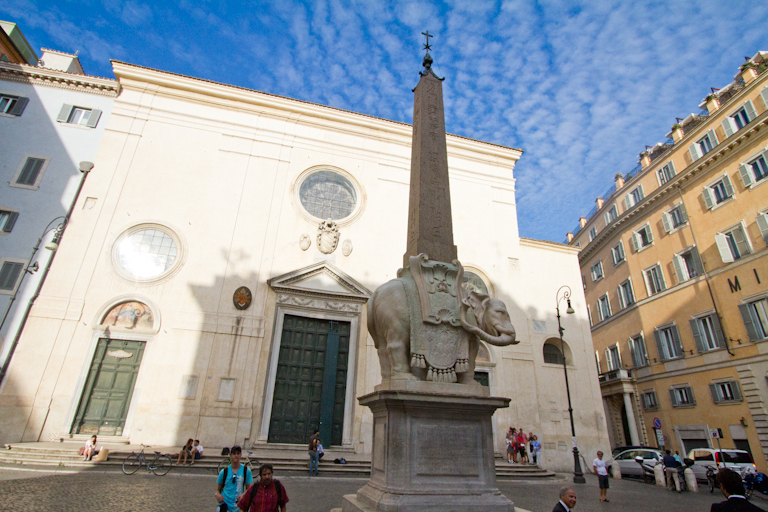 No chance of making that one, so we need to walk back to a church near the Pantheon. Having not eaten much at lunch, again (it’s becoming a theme with her), we saw a McDonalds while we were walking and stopped in. 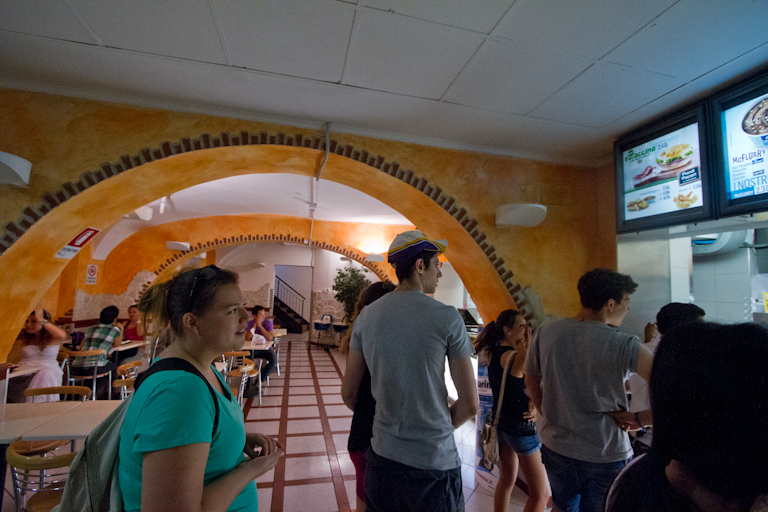 They had a 1 Euro menu that includes a cheeseburger. We each got a cheeseburger, and I got a 1 Euro milkshake. They serve some interesting things here like shrimp and pizza. I was tempted to try the pizza, but we’ll be doing something else for dinner I’m sure. Theresa saying "This is not all for me!" After the snack, we continued our walk to the church. Now we’re starting to get a little tighter on time. The church closes at 7pm. T was speed walking to get us there, and she felt the baby flip a few times. We ended up getting there at 6:50pm, just in time to go inside. Again, not that detailed from the front. Though inside it looks very different. It was an interesting statue I guess. 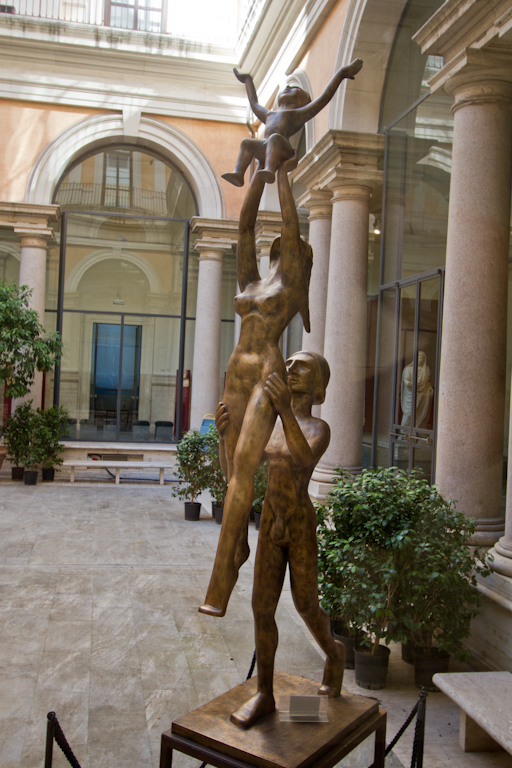 Like the audio guide said, the statue by Bernini in the Borghese museum of Aeneas, Anchises, and Ascanius fleeing Rome was posed in a similar way. 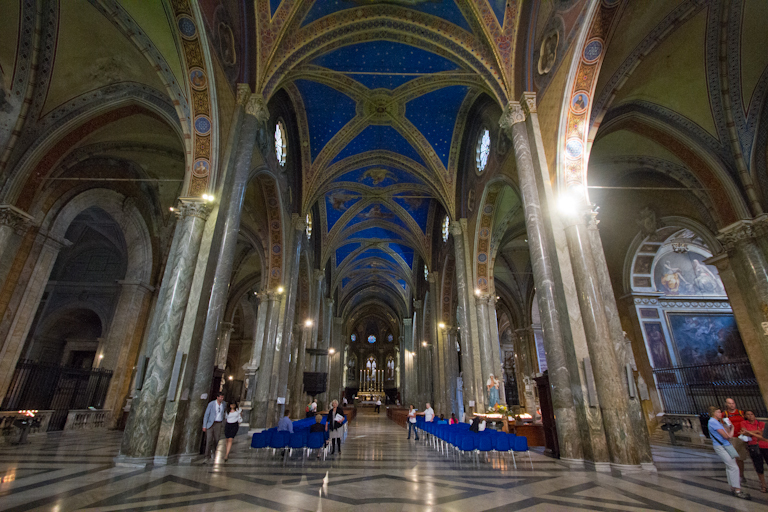 We looked around the rest of the church for a bit then headed to the other supermarket for some more snacks. 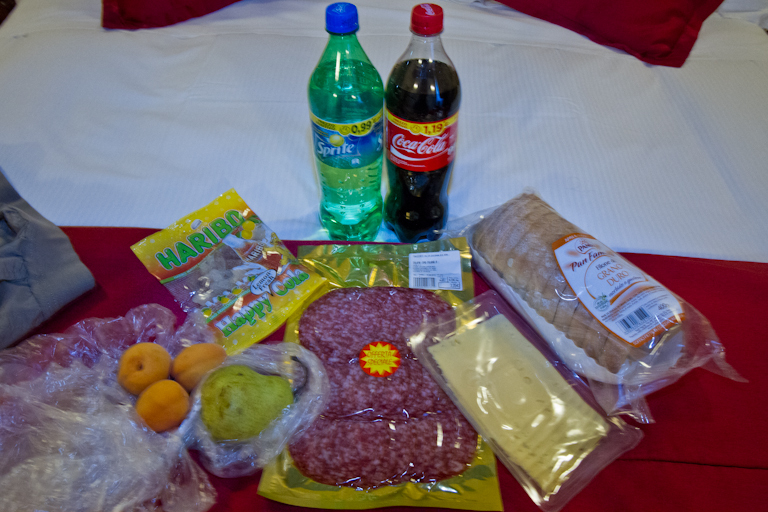 T got some fruit and drinks, while I got cheese and salami and bread. We snacked and read just a little bit when we got back to the room, and then by 9pm we left for dinner. We’ve adjusted to that part pretty well I guess of eating super late. 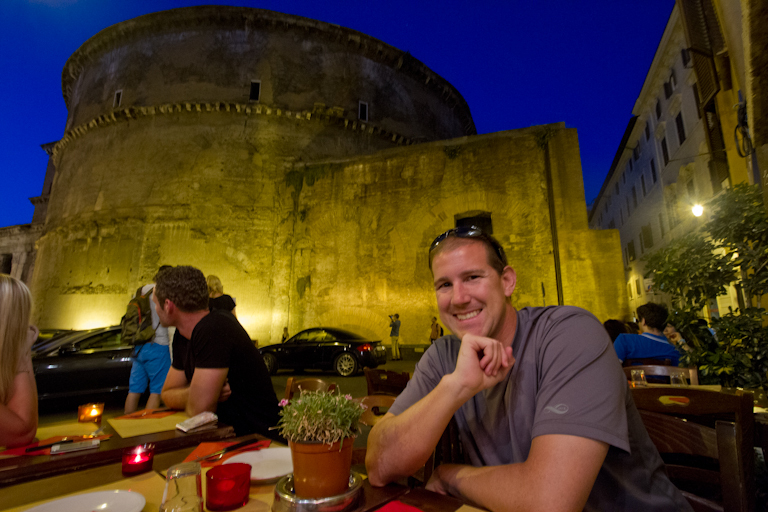 Just behind the Pantheon is a restaurant recommended by Rick Steves called Miscellania. Their prices were pretty decent, and they have a fantastic location. I asked for a polenta with sausages, but they were out. Instead I had Ravioli, which was just okay. 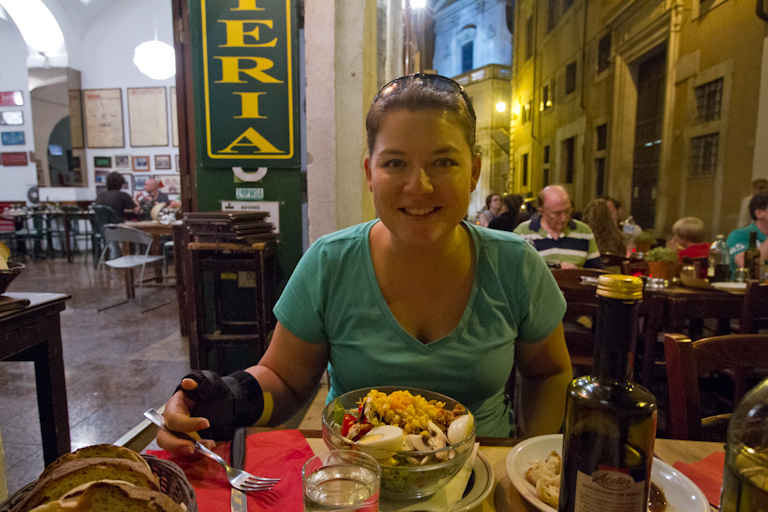 T saw they had a make-your-own salad, and tried to tell the waiter what she wanted. Eventually though it just turned into pointing at the ingredient somewhere else on the menu since she didn’t know the Italian name for certain things. She wanted a salad with lettuce, red lettuce, carrots, corn, egg, avocado and black olives, but they were out of avocado and gave her walnuts instead of olives. Guess she wasn’t pointing good enough. A few musicians came by to play for the tables and ask for tips. One guy had his guitar and played Beatles music, another couple had a guy screeching away on a violin while she sang. Theresa said neither of them improved upon the silence. The servers did a pretty good job of keeping them from bugging the tables, and shooed them away when they were done. They were free to get people to come give them tips voluntarily, but not to go table to table asking for money. 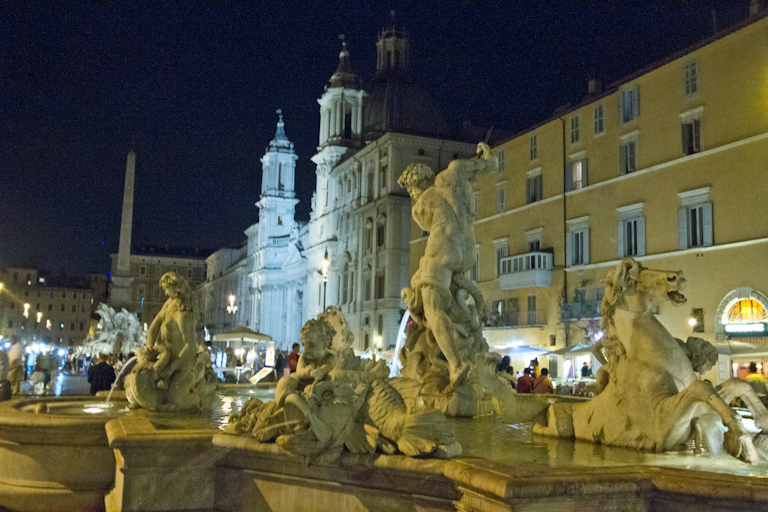 After dinner, I suggested walking to Piazza Navona to the four rivers fountain to end our night with some gelato. 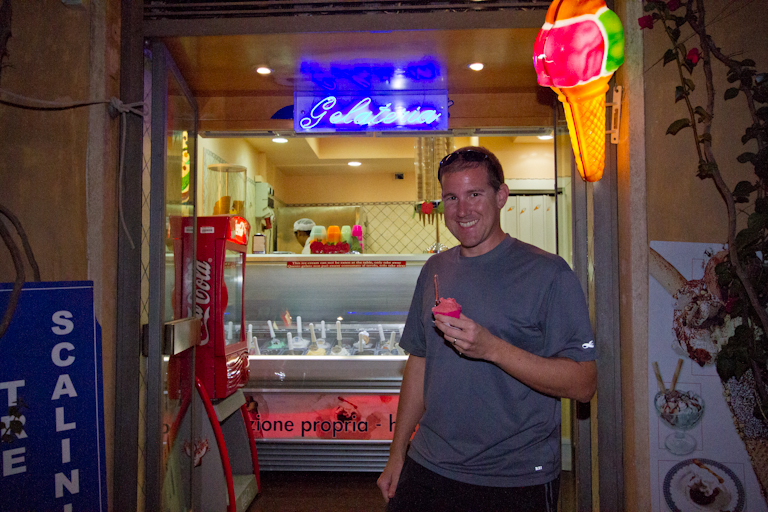 It was here that T had the “best strawberry gelato ever” about 6 years ago. I was hoping it would still be as good. I ordered one scoop in a cup, and we walked to a bench to try it. T had one bite and said it just tasted like sugar. Either they changed the recipe or her tastes have changed since the last time we were here. Either way, I ate a little more and then tossed it. 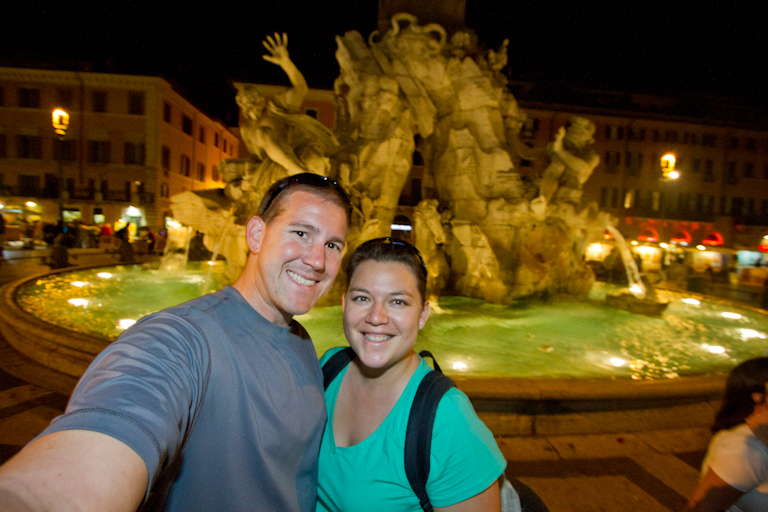 We walked around the two fountains, taking pictures and thinking of the fun time we had in Rome. On the walk back to the hotel Theresa asked me how I liked the first part of our trip. I told her I had more fun that I thought I would. I wasn’t sure how she’d do with all the walking and heat and didn't know how much we'd get to see. But she was a trooper and we were able to get through quite a bit. I think we saw just about everything we intended to see, so I’m leaving here satisfied. 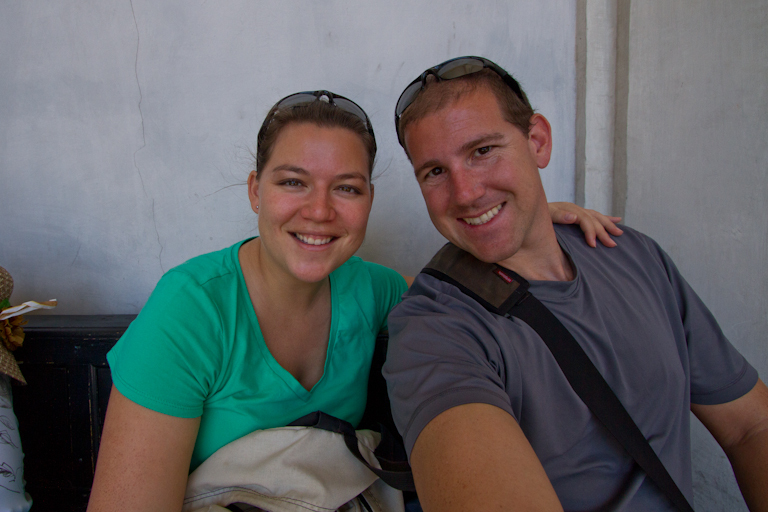 Tomorrow we board a train to Florence! Wow I'm envious of your amazing weather! 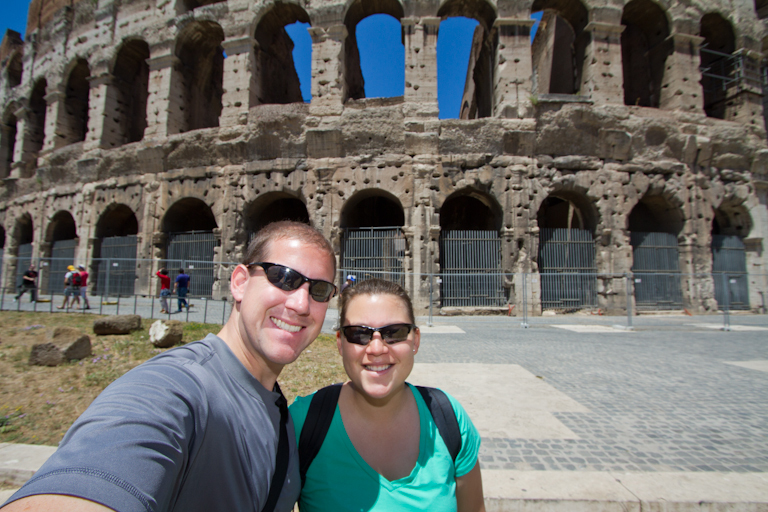 When I visited Rome back in March it was frigid and the day we visited the Colosseum was rainy with the most freezing wind! Thanks for such a great report and it's fun for me to re-live my trip a little bit. Luckily for us, the weather was just amazing the whole time we were there. I'll never complain about sunshine and blue skies, even if it's a little warm. Glad you're enjoying the trip report!